Hungry Huskies – times two! As a proud UConn Alum (whose graduation date is under lock and key), The Sailbag Lady was extremely thrilled to see both the men’s and women’s University of Connecticut Huskies become NCAA basketball champs earlier this month. 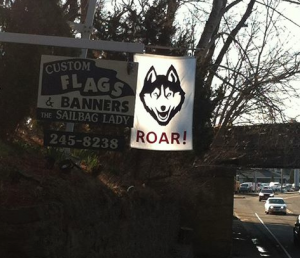 If you or someone you know shares our Huskie Fanaticism, order your own Huskies Roar banner.